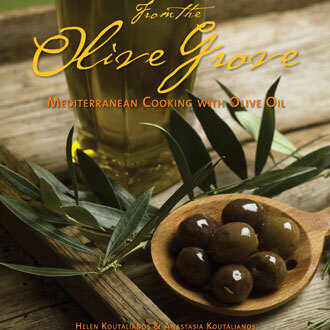 If you don’t have the good luck to know a Greek family, deeply tied to their homeland and famous for their wonderfully-cooked family meals, then From the Olive Grove will introduce you to that family, their kitchen and make you feel right at home. In their new cookbook, authors Helen Koutalianos and daughter, Anastasia have captured a refreshingly personal and down-to-earth presentation of traditional, flavorful Greek cooking. This book does not put on the typical airs of artistically-styled food shots on every page, or embrace the latest, hottest ingredients popular with foodies, but is a reminder of all the wonderful classics that make up the flavor profile of good Greek cuisine. Starting with the kitchen essential, extra virgin olive oil, affectionately referred to as “liquid sunshine”; and supported by Mediterranean diet staples including fish, lamb, lemon, feta, eggplant, yogurt, cucumber, among other healthy, fresh ingredients. And the authors know of what they speak. As fourth generation, certified-organic olive growers from the Peloponnese region of Greece, they produce Koroneiki-varietal extra virgin olive oil and balsamic vinegar from homegrown Corinthian grapes. And with a family member who is a first generation vegetarian, many of the recipes paid homage to plant-only options. What I liked best about this cookbook is that it is a fresh take on a somewhat underrated cuisine, filled with “real” Greek family recipes that I would actually be motivated to cook. It reminded me more of the food-stained classics that occupy a shelf in my kitchen than those taking up space on the coffee table. With the growing popularity of the Mediterranean diet, Greek cuisine deserves its due and this cookbook provides it.